Whoever does not carry their cross and follow me cannot be my disciple. Don’t be surprised if you are set at nought. 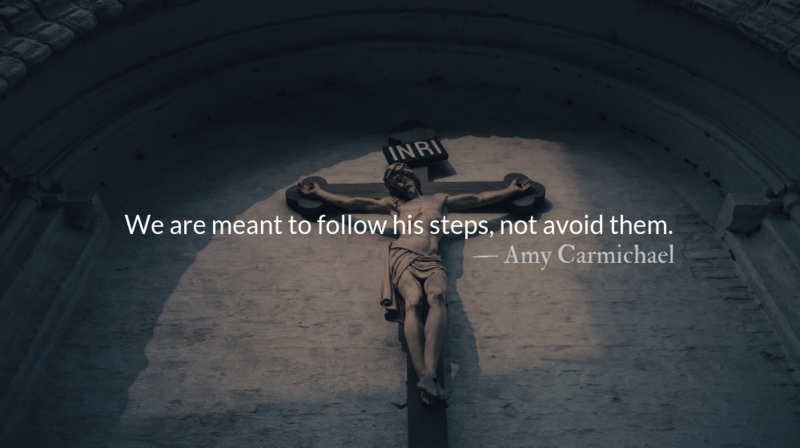 It is part of the way of the Cross. Have you ever gone through your New Testament marking the places where the iron of suffering in one form or another is mentioned? It’s wonderfully enlightening. The book is full of joy, I know, but it is also full of pain, and pain is taken for granted. “Think it not strange. Count it all joy.” We are meant to follow his steps, not avoid them. What if the suffering is caused by those whom we love? Was his not caused by those whom he loved? It is no small gift of his love, this opportunity to be offered upon the sacrifice and service; something you would not naturally choose, something that asks for more than you would naturally give. That’s the proof of his love. So rejoice! You are giving him what he asks you to give him: the chance to show you what he can do. *Edited for length and language updated from Candles in the Dark. The fight to which we have been called is not an easy fight. We are touching the very center of the devil’s power and kingdom, and he hates us intensely and fights hard against us. Jesus taught his disciples that they were wrong about tragedy and wrong about sin. His words don’t at first seem comforting. “Repent or perish,” he says. It’s not that “they” were sinful, it is that “all” are sinful. We don’t suffer for sins. We suffer in sin. 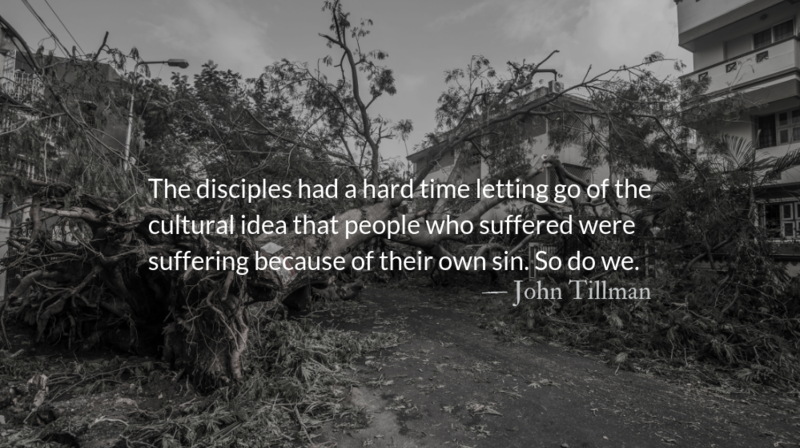 The disciples had a hard time letting go of the cultural idea that people who suffered were suffering because of their own sin. So do we. We cling to this idea today because we feel less responsible for problems in the world when we can believe that only the lazy are poor, only the promiscuous are in danger of sexual assault or disease, only hedonists become addicts, and only nihilists suffer depression or have suicidal thoughts. Our culture prefers to explain sin and suffering by pointing the finger at individuals. We prefer to believe that people are basically good and that evil is an aberration. Scripture offers a more realistic truth—that there is no one righteous. No not one. Our culture also is ill equipped to deal with suffering or death. When the only joys one acknowledges are limited to this life, anything that shortens life or even makes life less comfortable is evil. But Jesus wasn’t threatening earthly death or suffering. Earthly suffering or death holds no terror for those holding on to Christ and his cross. Our fear of death and suffering is directly related to how tightly we are clinging to things of this world for our hope. When it comes to sin, we like to picture ourselves occasionally getting splashed with it as if we were on the shore of the ocean. But a better analogy is that we are drowning, forty fathoms deep in sin. Every part of us is soaked and our lungs are being crushed by the pressure of sin’s weight. Our hope is not that others more sinful than us will attract God’s wrath and allow us to live comfortably in this life. Rather, there is a sinless one who chose to suffer on our behalf and who grants us his righteousness. He lifts us from the depths and no matter our sufferings in this life, offers us a new and restored life in him. Whatever tragedies we face, we can do so with a partner in Christ, setting our face toward our Jerusalem of suffering, knowing that Christ will walk with us every step. When the disciples and religious leaders saw the man born blind, they saw only sin. Jesus saw God’s glory. Who then is the faithful and wise manager, whom the master puts in charge of his servants to give them their food allowance at the proper time? It will be good for that servant whom the master finds doing so when he returns. We looked yesterday at our need to recognize that praying for daily bread includes an acknowledgment of our need for intentional connection with God and cultivation of his Word into our lives. 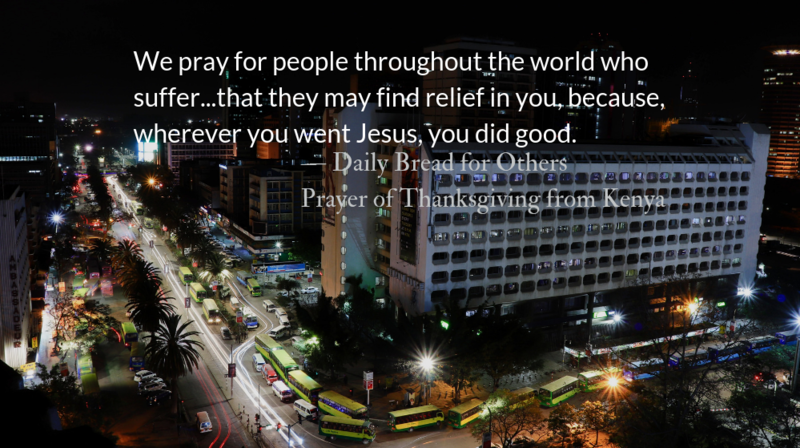 Today’s prayer from Kenya, begins with thankfulness for our ability to have communion with God and moves into a prayer of intercession for those for whom “daily bread’ is a distressing physical need. As demonstrated in this prayer, communion with God in thankfulness for our blessings sets our feet on path that leads us to have compassion for others and continues to lead us to a place of action, through God’s work in us, on behalf of others in need. Whether the needs around us are informational and relational or physical and financial, may God make us instruments of his grace on behalf of our communities. As this prayer says, wherever Jesus went, he did good. We cannot truly be his followers without joining in the work he does. Almighty God, Maker of heaven and earth, Creator of all that we can see and all that we cannot see, Father of our Lord Jesus Christ our Savior, we give you honour and praise. You created us in your image so that we can have communion with you, so that we can learn. Be in us so that we can become all that you would want us to be. We thank and praise you for your provision which comes to us daily without which we could not stay alive. We thank and praise you for your presence within us which casts out fear and doubt from our lives and helps us to tackle daily problems with courage and confidence. We pray for people throughout the world who suffer either from hunger, disease, war, or other calamities, that they may find relief in you, because, wherever you went Jesus, you did good. We thank you Almighty God because you hear us. We thank and praise you in Jesus’ Name. Renew our faith in you, expect us to “bear fruit” and make us willing to share with people around us. Our disenchantment with prayer is not that we ask our Heavenly Father for daily bread, or a fish, or an egg, and he reneges. Our problem is that we ask our Heavenly Father for snakes and scorpions and then are upset when we don’t receive them. Daily bread does include that which is required to sustain our lives. But daily bread is about more than sustaining our physical life. It is about sustaining our spiritual life. Daily bread refers to a daily need for God and purposely highlights the need for spiritual disciplines that are required for us to grow in faith. Bread was a common symbol in Jewish culture of God’s Word and of spiritual nourishment and spiritual health. 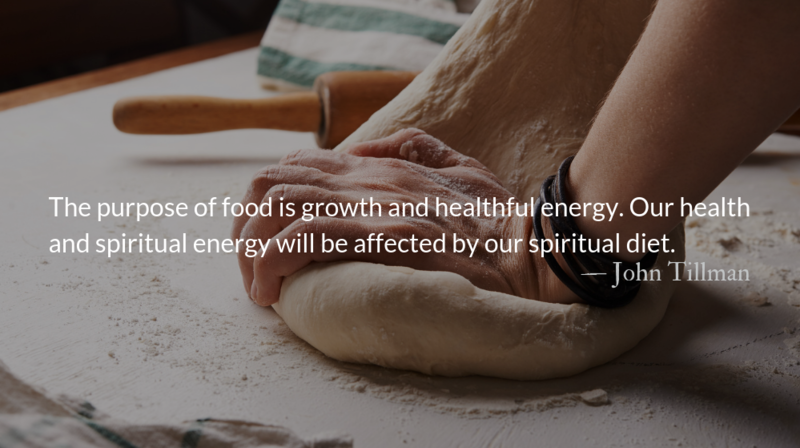 The purpose of food is growth and healthful energy. Our health and spiritual energy will be affected by our spiritual diet. When it comes to our spiritual diet, we too often rely on packaged and processed foods eaten with little thought or art in preparation. In many ways, our spiritual health will benefit if we live less as spiritual content consumers and more as spiritual subsistence farmers—eating out of our own garden. What maintains our spiritual health? The spiritual food we eat. What are we eating? We eat what we have reaped. What are we reaping? We reap what we have sowed. What are we sowing? We are sowing the seeds we cultivate. We pray that you will use the reflections we bring you each day to plant, tend, and cultivate God’s Word in your life. Therefore my heart sings to you without ceasing; O Lord my God, I will give your thanks for ever. The gospel is a seed from the first garden, the garden of Eden. The seed of the woman, Jesus himself, is our salvation and we plant this seed in our own hearts. Harvest implies cultivation, but when it comes to faith, too many of us are hunter-gatherers. We can become complacent about Christ’s nature. The disciples did. Being so close to him—seeing him sweat, and eat, and wearily lie down to sleep in the back of the boat—they often saw only the man. But in the storm, they see him for who he is. Seeing Jesus truly is always shocking. No matter how great a grasp of the incarnation we think we have, our intellectualism has a hard time grappling with Jesus rebuking the wind and waves. A Jesus this powerful is frightening. If he rebukes the wind and waves what about us? He might ask us to do…anything. He might send us to save…anyone. He might ask us to give…everything. 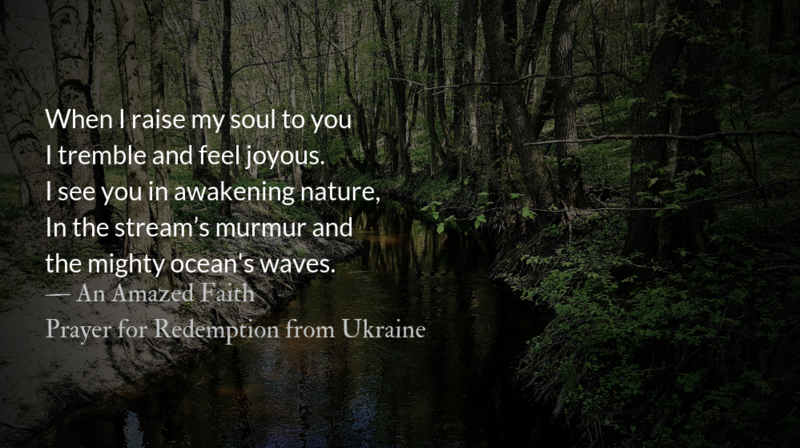 This prayer of redemption confesses our position, and expresses wonder and thankfulness that Christ, despite our weak faith, works his redemptive power in our lives. I tremble and feel joyous. In the stream’s murmur and the mighty ocean’s waves. You rule all the universe, everything is created by you and is subject to you. Nobody, nothing can resist you. Every creature who breaks your laws perishes. To seek something of my own. I sinned, but you loved me, looked for me, found me, forgave me, and adopted me as your child. I cannot comprehend the depth of your love! Send your son, Jesus Christ? And be yours for all eternity? To love you and to wait for you every day! In me daily till we meet with you in Heaven!